A key tenet underlying alchemy is that there is a life force that pervades all things. This concept is not specific to alchemy but pervades many spiritual traditions. Different traditions refer to this life force as varying names – spirit, prana, chi, nous, azoth, to name a few, but they all refer to the same underlying concept – the permeating energy or force that provides the breath that animates all manifested life. Recently I had conducted a basic alchemy experiment which was said to provide evidence of this life force and to demonstrate the ability of the individual to control the life force. 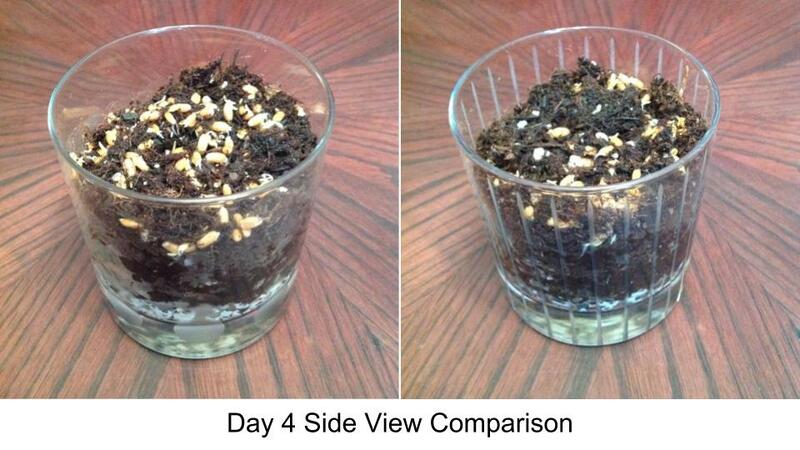 This experiment was conducted over seven days and involved the growing of two separate plants. One plant was subjected to direct control by my personal consciousness, whereas the other plant was ignored. Both plants were placed within the same environment and were offered the same level of material support – water, sunlight, etc. The only difference was that of the unseen spiritual elements. For example, the plant receiving positive influence of consciousness, a plant that I had ultimately named Abundance, received positive reinforcement and encouragement, exposure to classical music, and influx of earth energy and consciousness. The other plant received none of these benefits and was left with strictly material support. It is said that the life force is one of the reasons why mechanistic attempts to create life fail. Scientists believe that life may be created through a specific combination of mechanical parts of chemical compounds, but these approaches fail as they do not take into account the life force and consciousness aspects inherent to all manifested life. This series of articles provides a detailed account of the experiment procedure, the achieved results, and the lessons learned. If you so desire you may follow along by mirroring the steps I have outlined within this article, or modify them based on your own style. Within this article I emphasize the “whys” of particular actions and inform you as to the importance of staying true to certain steps within the process. I will now walk you through each of the seven days of the experiment and provide a summary of the lessons learned from this brief, but informative experiment. By the conclusion, you will have sufficient information to conduct the experiment yourself and witness the effects of the life force upon the expression of conscious life. This first article will focus on the first five days of the experiment. A handful of wheat grass seeds were placed in the bottom of the plastic cup. 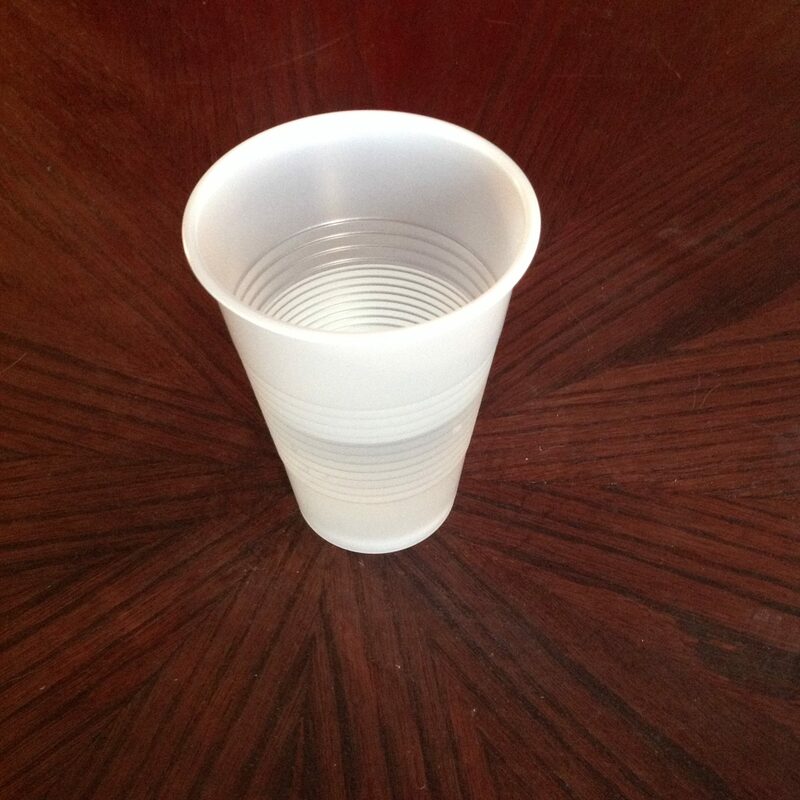 A small amount of the bottled water was poured into the plastic cup; only a sufficient amount of water to cover the seeds was poured into the cup. If you are following along with this experiment please note that bottled water is not required. I had used bottled water as it has been said that there are health benefits of drinking the water after the seeds have soaked within it. So feel free to use any water you like, bottled, tap, etc. Also, feel free to use your plant of choice for this experiment. I used wheat grass as it was something I had on hand and it was something that we grow regularly wtihin our household as our cat quite enjoys it! 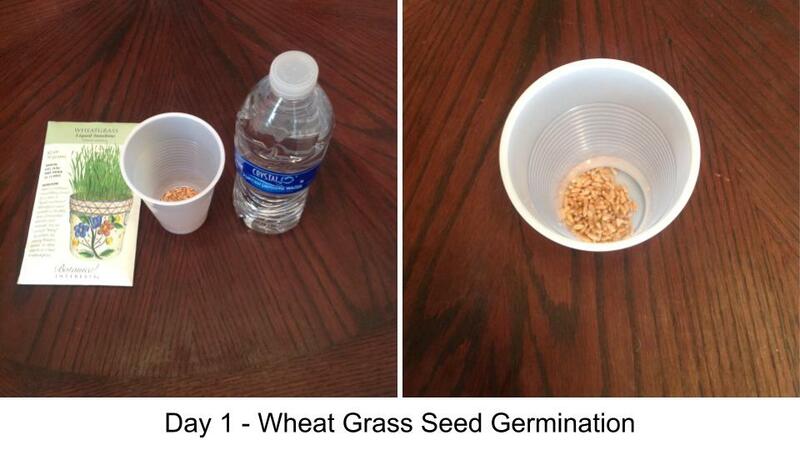 The wheat grass seeds were soaked within the cup filled with bottled water overnight (approximately 24 hours). This is said to germinate the seeds which will allow them to grow at a faster rate. The first image above shows the collection of the package of wheat grass seeds, a plastic cup, the wheat grass seeds within the plastic cup and the bottled water. The second image shows the wheat grass seeds germinating within the water and plastic cup. I had taken each of the two glasses and filled the bottom of each glass with aquarium gravel. The remainder of each glass was filled with potting mix, leaving some room at the top to allow for the planting of the germinated seeds and for subsequent watering. Next I had divided the germinated seeds equally within two groups and poured each group of seeds in a separate glass. Afterwards I had watered each group of seeds in order to moisten the potting mix. The two glasses containing germinated seeds were separated by approximately 24 inches. I next designated the glass pictured on the left (the glass with the circular patterns) as the plant to be infused with positive energy and the glass on the right (the glass with the straight line pattern) as the plant to be ignored throughout the experiment. As I had mentioned in the previous day comments, it is not imperative that the same materials be used. For example, I had used glasses so I could clearly see the roots and the differences between the roots of the two plants. However, you may choose to use coffee cups or solid pots when performing this experiment. 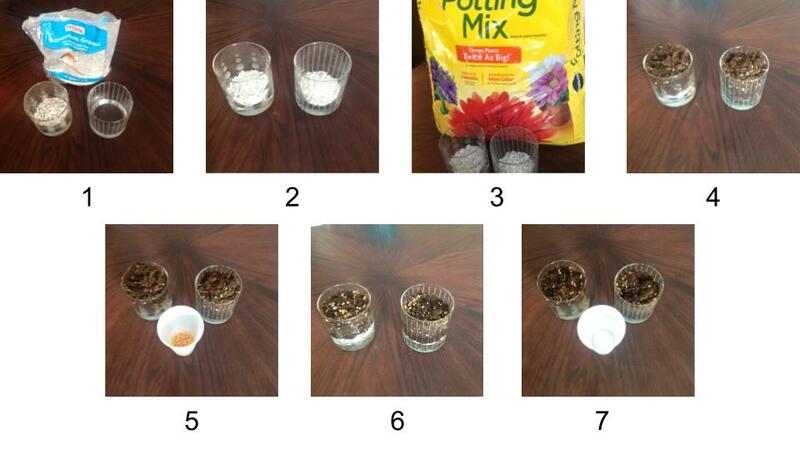 The preceding seven photos illustrate this process – secure aquarium gravel for experiment (Image 1), pace an equal amount of aquarium gravel within the glass (Image 2), secure potting mix for experiment (Image 3), place an equal amount of the potting mix in each glass (Image 4), retrieve the germinating seeds (Image 5), distribute the seeds evenly within each glass (Image 6), and provide an equal amount of water to each plant (Image 7). 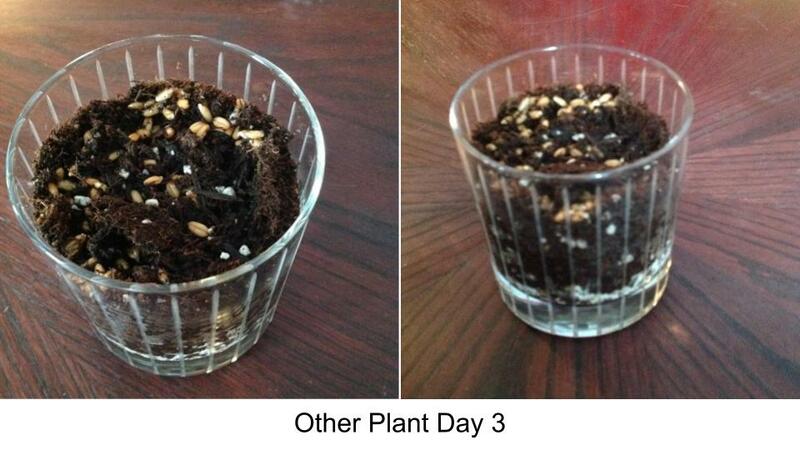 The preceding image shows the distance between the two plants (approximately 24 inches) and this is where the plants remained for the duration of the experiment with exception to Abundance being moved during meditative sessions and at one point during Day 5. Day 2 marked the first day that I had deliberately focused my consciousness to impact the growth of the plants. I had showered the Positive Plant with focused positive energy through focused concentration of consciousness and love force, positive affirmations and classical music for a fifteen minute duration. I would also acknowledge Abundance in a positive way when passing it throughout the day. I ignored the other plant throughout the day and went out of my way to avoid and not direct any energy whatsoever (neither good nor bad) towards the other plant. Concerning the meditation and work with the love force, I had used the meditation and visualization process as outlined within the book Wisdom of the Mystic Masters by Joseph J. Weed. Meditation and visualization exercises within this experiment were conducted each evening, approximately an hour after sunset. There was no specific reasoning behind the designed time, it was just convenient for my schedule. When performing the meditation and visualizations, I would take Abundance to another room and begin playing classical music. Abundance was placed before me while I focused my positive energies on Abundance. The Day 2 Session lasted fifteen minutes. The classical music was a random selection from the Classical Music Radio station on Pandora. At the start of Day 3 I had planned on watering each plant with the amount of water within the first photo, each plant would receive half the amount within the overall plastic cup. However, after watering Abundance he quickly became over saturated, so I drained the excess water and discovered that the other plant had plenty of water so I abstained from watering either plant. 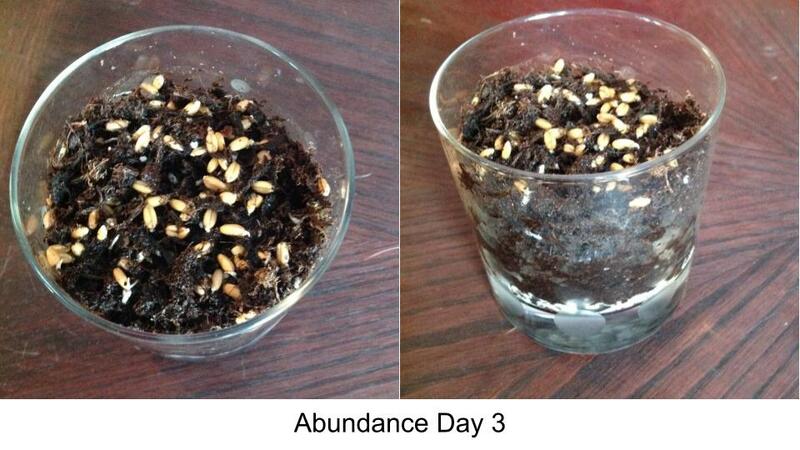 On the morning of Day 3 both plants were beginning to show signs of initial sprouting. The first set of photos is of Abundance and the second set of the other plant. In a way one may liken my treatment of Abundance to that of a loving parent nurturing a child. I demonstrated a loving, caring, and encouraging attitude towards one plant and indifference towards the other. I continued with my visualization and direction of the higher and vibratory love force towards Abundance and visualized this plant as bursting from the seedlings and sprouting into a lush, green, and abundant patch of wheat grass. Throughout the day when I encountered the plant I focused loving thoughts and praise upon Abundance and greeted him in a pleasant manner. The other plant was left on its own in the other room during the focused positivity sessions which lasted fifteen minutes in duration. I had considered naming the other plant but decided against it so as not to focus undue attention on this plant. Throughout the day I ignored the other plant. Day 4 was the first day that I actually referred to the positive plant as Abundance. Prior to that Abundance was simply referred to as the positive plant. I did not water either plant on the morning of Day 4 as they did not require it. 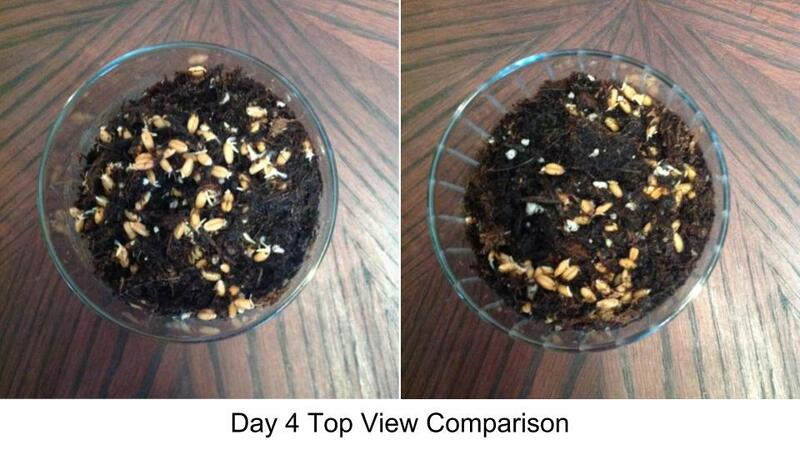 Day 4 was the first day where there was a noticeable difference between the two plants. The images below show a top view comparison of the two plants; the plant on the left is Abundance and the image on the right is the other plant. There was a noticeable difference in the number and quality of sprouting between the two plants with Abundance showing a higher quality in both instances. The following is a side view comparison of the two plants; the plant on the left is Abundance and the image on the right is the other plant. -Visualization of a fully grown and lush plant. –You will grow quickly and abundantly, etc. –Conveyed the purpose of Abundance to serve as nourishment for me and my family. The other plant was not shown any sort of attention. This article provided you with a basic understanding of the life force and how this life force may be focused and directed towards the further expression of life. So far I have illustrated the first four days of this seven day experiment which consisted of germinating the wheat grass seeds and subjecting the positive plant, Abundance to concentrated sessions of positivity and classical music. The next article will begin with Day 5 and include some interesting subtle techniques that were used to accelerate the growth of Abundance! I really enjoyed my chakra scan with John Sedivy. He's strong enough to hold space for me to be all of me. His scan was really accurate including some messages in exact wording as I have been receiving for the last month or so. The channeled prayer was absolutely lovely and I wish I had thought to record it. There were a couple of unusual combinations of words that sang to my heart. If you want to clear and align your chakras so that you can move forward in life with joy, groundedness and courage, John is your man. Thank you." I received an energy clearing from John the first part of August. As a result of that clearing, many doors have started to open for me and my family as well. Slowly I can feel the shift in my life. I am thankful for his knowledge and help and know with A lot of discipline from myself everything we set into motion that day will manifest! Forever Thankful for what he has to offer the world! The energy scan and clearing that John did for me was amazing. He described me to a T, intuitively sensing core unconscious patterns and suggesting the fastest route to shift things to a new level. He also identified the underlying relationship between issues I’d been experiencing in a way that totally resonated with me. In addition, he was very thorough in explaining what was going on energetically, and he incorporated all of these insights into a full clearing. John has a deep understanding of energy and universal principles. He’s also gifted at clearing old slogging energies that don’t serve you. If you’re looking for someone to zero in on exactly what will bring you the ease you’re looking for and also help you understand your energy patterns, do yourself a favour and ask John for an energy scan. I had the pleasure of having an energy scan done by John Sedivy, and was I ever amazed!! He was so spot on! As he tuned into my Chakras, without knowing why, he was drawn to my throat and solar plexus. As he explained what he sensed through these two chakras, I was quite amazed. I’ve been working on both of these chakras, and although they’ve improved, I’ve still got a bit to go. John shared and I agreed that as I step into my power through my solar plexus and let myself be seen and heard through my throat chakra, all that I am wanting and looking for will come to be. Once again, thank you John!" I had a great scan with John Sedivy yesterday! John has an amazing laser like skill in getting down to the essence and pain points pronto! At the same time his heart is full and he has true compassion as he delivers his message. The healing also left me with a feeling of increased energy and challenge. The enrollment call was full of confidence standing in his power and abilities. Thanks again John a lot to reflect on and consider." O.M.G. John Sedivy is an amazing healer and coach! I just had a scan and healing with him and it was AMAZING. He did not dabble around my chakras individually for very long before seeing RIGHT THROUGH to my deepest pain. He spoke to the inner me, the one who knows what's going on but wants to avoid it. He allowed me to see how much pain I really am in lately as I waffle around trying to transition to the next level - afraid to take a step forward. He allowed me to see my power and not be afraid of it or try to pretend I don't have it. He gave me strength to venture forward, one step at a time. He is a VERY POWERFUL HEALER!" I saw a notification on energy reading and decided to give it a try. I had been experiencing blocks and had a lot of things going on in my life that were holding me back. When John did the energy reading a lot of things started to make sense. I realized I was reverting back to my old ways and not honouring my being and my soul. I am thankful that we connected and I would highly recommend John. Thank you John. If you get the chance to get an energy scan from John Sedivy, don't pass it up. John's ability to detail exactly what was going on with my energy, and to pinpoint specific blocks, challenges and strengths is truly mind-blowing - and I say this having worked with literally dozens of talented intuitives over the past three years. Both the speed and the depth of his intuition are downright amazing. He also delivered an intensely powerful clearing and healing which I could feel to the depths of my soul. Thank you, John!!" I was amazed when I had the energy scan session with John, didn't expect anything like that - I had other energy scans before but he is absolutely unique - where other people take from 10 to 20 minutes to focus enough to start the session, in a few minutes he focused and started an amazing flow of words, all true and direct; the day after, things started to shift a bit for me, like in a new beginning of a more hopeful life. He's a very kind and gifted person and I would recommend him to everyone who is in need of clarity and of help in getting back on the right track in their life. Blessings and many thanks, John!